HOUSTON (KTRK) -- All the recent rain has many Houstonians battling the bugs! Mosquitos, ants, and roaches are out with a vengeance this time of year, but you don't need to hire a professional to get rid of them. There is a solution for just about every bug, pest, and rodent, says Keith McCoy with Solutions Self Chem. While the pros can help you combat the problem, you can do it yourself for a fraction of the cost. McCoy says a product called Flex 10-10 works well to control mosquitos. We called the professionals, and one application will cost about $80. But you can do it yourself and it will run you about $50 for about four or five applications of the typical yard. "Use it as a spray it in the heat of the day, that's very important, that's when mosquitos are resting and protecting themselves from UV light," McCoy said. Look for these products to battle the bugs! If you have an area of land that constantly has standing water, try Mosquito Dunks. "If you have some low lying areas in the yard, bird bath, fountains in the front yard," McCoy said. "As it dissolves, the mosquito larva actually feed off of then and it kills it." To treat beds in your lawn and landscape, a chemical called Bifon L/P Granuals will help control fire ants. A bag costs $29.95 and will last 7-10 applications. If doing it yourself, you can spread it like lawn fertilizer. To treat an ant colony quickly, try a product called Reclaim in a concentrated form and use the "drench" method. It costs $50 for a pint, but will make 16 gallons worth. "I recommend get you a five gallon bucket, mix your product in your bucket according to the directions, and take it and pour it into the mound and soaks into the soil really quickly, and get to the queen," McCoy said. 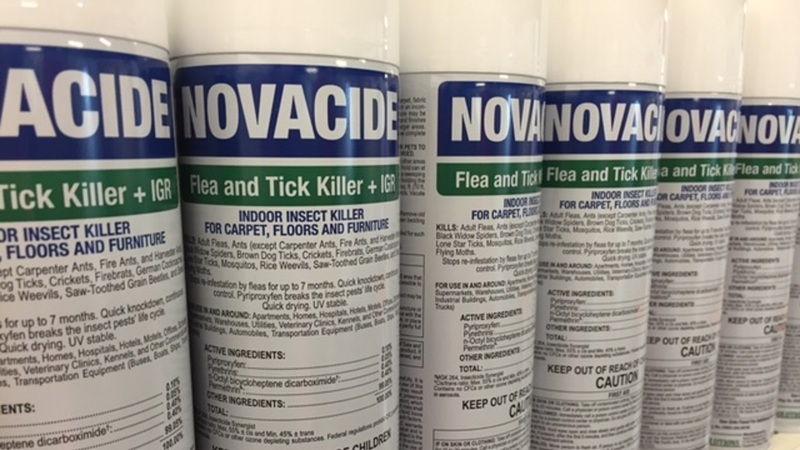 For those who need to combat fleas and roaches in the home, a customer favorite product is called Novacide for $27.99. "I like this one because it's all in one and ready to go in my house. It's conveniently packed in a pressurized can and can be used for roaches, ants, ticks and fleas," McCoy said. For long-term roach control, try Ficam Baim, which can be purchased for $39.99. "You can use it up in the attic, they will actually feed on it and you can use it in the perimeter of the house as well," McCoy said. When using any of these products, be sure you read the directions carefully and use safety goggles and gloves.